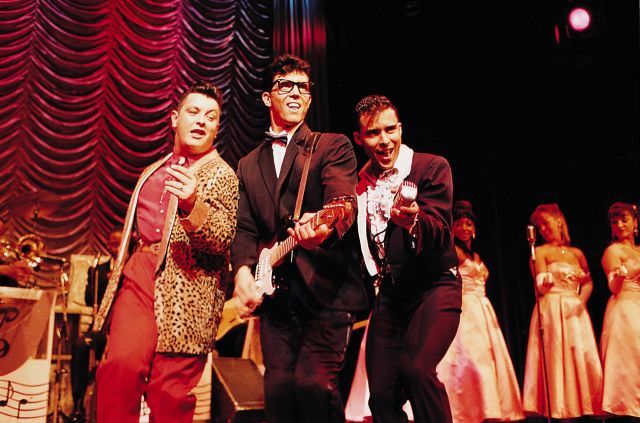 Buddy, which is currently on tour in the U.K., tells the story of the early rock & roller Buddy Holly, who shot to fame in the late 1950s with such timeless hits as ‘That’ll Be The Day’, ‘Peggy Sue’, ‘Oh Boy’, and ‘Rave On’. Hailing from Texas, he achieved huge success in a relatively short period of time, only to die tragically at the age of 22 in a plane crash on February 3rd 1959, along with two other ‘50s rockers – Ritchie Valens (‘La Bamba’) and the Big Bopper (‘Chantilly Lace’) – on what became known as “the Day the Music Died” via the Don McLean song ‘American Pie’. 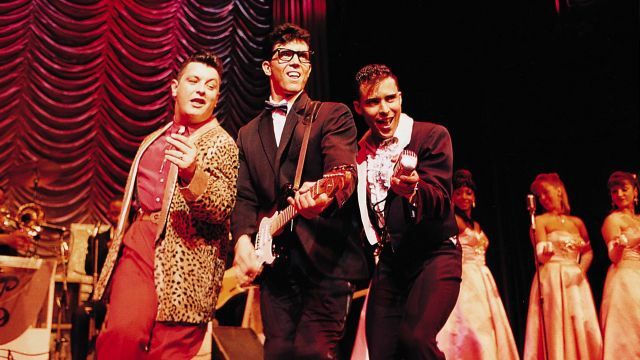 Buddy the musical was first staged in London in 1989, where it played for 14 years. It’s been produced on Broadway, and Australia – where it played for 36 weeks at Her Majesty’s Theatre, Sydney in 1991 before touring and returned to Australia and New Zealand in 2015. The show can be performed by a cast of 12+ (including actor/musicians) and is relatively simple to stage in terms of set. Eleven year old Winnie Foster yearns for a life of adventure beyond her white picket fence, but not until she becomes unexpectedly entwined with the Tuck Family does she get more than she could have imagined. When Winnie learns of the magic behind the Tucks’ unending youth, she must fight to protect their secret. Based on best-selling children’s classic by Natalie Babbitt and adapted for the stage by Claudia Shear and Tim Federle, with a score by Chris Miller and Nathan Tyse. If you relish the challenge of staging Alan Ayckbourn's plays, be one of the first to perform three of his most recent works. A terrorist is on the loose, and the police have planned a sting to capture him as he steps off a train in London. The operation, led by the buffoonish Major Quentin, has drawn in two civilians. Perfect strangers, their time waiting for the trap to be set gives them the chance to get to know each other, and try to make sense of the chaos unfolding around them. Two short plays that can be performed together or separately. Teddy’s marriage to Lottie is going through a difficult period. Does he still love Lottie? Does Lottie still love him? Cue: next door neighbours Penny and Reggie to the rescue. But with the arrival of the voluptuous Chloë all their best laid schemes are put to the test. Sexual intrigue at Teddy’s garden barbecue. Is his secret liaison with his neighbour, Penny, about to leak out? Will his wife Lottie discover the awful truth about Kidderminster? Though he's lauded in the media as a military hero, Murray is remembered less fondly in his old village. He left amidst rumours of arson, unplanned pregnancy and stealing his best friend's girlfriend. When he returns, 17 years later, with a new wife in tow, he creates trouble from the beginning - not least with his ex-fiancée. Aimed at addressing gender imbalance and inequality in theatre, Platform Plays comprise big-cast plays with predominantly or all-female casts, written specifically for performance by school, college and youth-theatre groups. You're born a girl. You grow up. You grow old. You die. But who is in control of your life story? Can you actually choose your destiny? And how do you forge your own identity along the way? During the First World War, seventeen-year-old Elsie Wright fools the world into believing she has photographed fairies in her garden. An ambitious young reporter seeks to expose Elsie as a fraud. But as she looks at the facts, she begins to think there's more to Elsie's story than a simple hoax. Inspired by the true story of the Cottingley Fairies. Cast: 9f 1m, plus mixed cast of up to 30 characters. As if the daily skirmishes with farcical customers and the dim-witted men in their lives wasn't enough, the women who operate the checkouts at the Discount Co supermarket are now facing a new boss and the prospect of losing their jobs to automated checkout aisles. Cast: 5F / 2M, (plus female extras). Miss Abigail’s Guide to Dating, Mating & Marriage! by Ken Davenport and Sarah Saltzberg. Let Miss Abigail take you back to a simpler time, before speed-dating! It’s Loveline meets Dr. Ruth as Miss Abigail shares her vast knowledge of every piece of relationship literature known to mankind. The audience participates in this variety show. Cruise Club by Liane Mills. Set sail for adventure on the cruise of a life-time to Bermuda aboard the beautiful Costa Lotta. It’s not all smooth sailing. Someone is trying to poison the passengers and nobody knows who will be next. Audience participation is a must.